Perfect on our enclosed “plant porch”! Add some excitement to any surrounding with these magnificent indoor/outdoor rugs. Floral, scrollwork, and animal-skin patterns in vivid color make this a truly eye-catching collection.These versatile rugs are beautiful to look at, soft to walk on, easy to clean by just hosing down and can withstand almost all outdoor conditions. 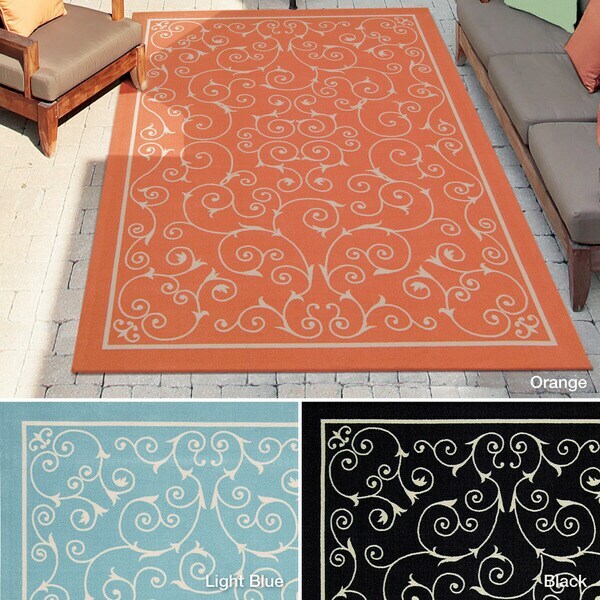 Option: Orange - 5'3" x 7'5"
I love the colors...I'm using this rug indoors, but I love the fact that I can take it outside and hose it down. Nice to step on like indoor carpet! Option: Black - 5'3" x 7'5"
I've had this rug for a few months now. It has stood the test of time. I have dogs and cats. My dogs have walked on rug with muddy paws and I was able to clean it up with a sponge, like it never happened. This rug is durable and is quality made. Love my new outdoor rug. Vibrant color and looks very well made. This is the perfect rug for on my front porch. It has held up well for being outside - it is on a covered porch, but does get some sun and exposure to the elements. I chose the black which hides dirt well, but is easy to clean. 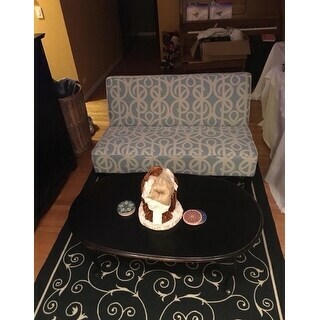 I absolutely love this area rug...it fits perfectly &amp; is exactly what I was looking for; it ties the room together beautifully! "Is this black and white or black and beige"
In my opinion, it is black and off white. 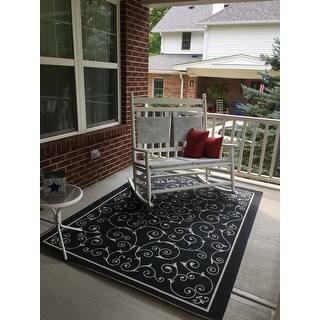 GAD Rize Beautiful Contemporary Indoor Outdoor Area Rug with Classic Medallion Black - 5'3" x 7'7"
Aubrey Transitional Geometric Indoor/ Outdoor Area Rug - 5' x 7'6"